The Review of Round 10 is brought to you by fit-out specialist ONE68. Kent Waring and the team can assist with all your requirements whether it be a fit-out, joinery, office furniture or project management. ONE68 operate in the retail, commercial and hospitality sectors. Kent can be contacted on 9518 5168. Saturday produced a great set of results with the Seniors and Hearts both recording solid and important victories. Important for the boys because it rewarded their efforts over the last few weeks. Important for the girls as it helps solidify their spot in the top four. 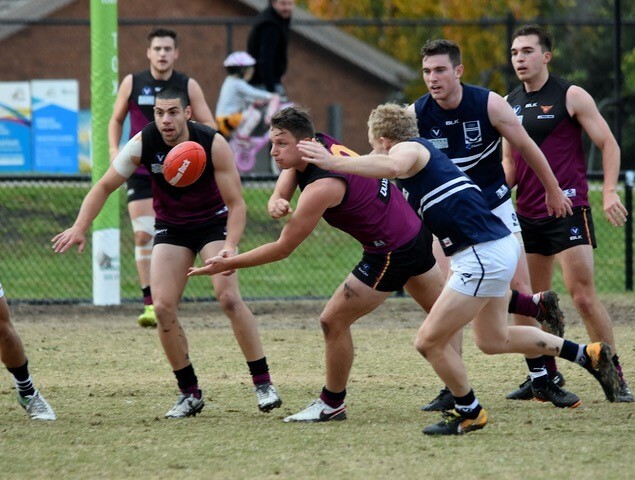 The Ressies were game again in defeat, while the First XVIII had an emphatic victory over Geelong College. Tim Witherow played his 100th game for the club on Saturday. Tim has become a pillar of strength in the backline after moving “back there” a couple of seasons ago. 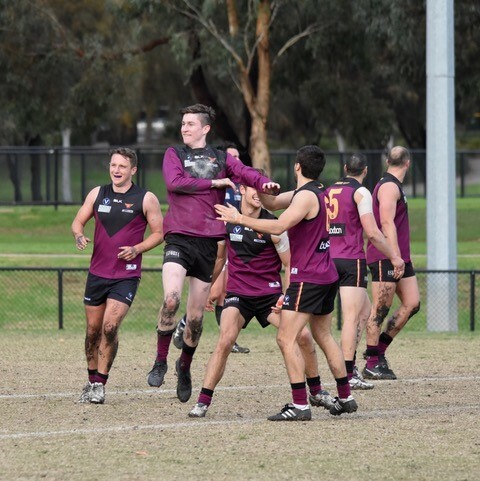 Renowned for his speed and attack on the footy, he has played in both recent premiership sides and is now one of the real leaders around the club. Congratulations are also extended to Joel Constable who played his 50th game. Also known for his attack on the football, Joel is a real student of the game and is bound to represent the club a lot more in the years to come. Contests between the Bloods and Caulfield have produced some terrific games over the last two years and this one was no different. The first few contests demonstrated the willingness of both sides to have a crack in soggy conditions. Trevo started in the ruck and gave the boys first use of the ball for these contests. The forwards were given opportunities of various quality which reflected on the scoreboard with only one major being registered for the quarter. Jack Munro was enjoying his role up forward as was goal scorer, Nick “Two Bucks” Gooda. The visitors appeared to score a bit easier and the Bloods trailed by 9 points at the first break. In the huddle at quarter time, coach Ward wasn’t happy and implored the players for a greater effort. The boys responded well, kicking the first couple of goals for the quarter, with Loewey and Sec both being rewarded for their hard work. Gledders and Shak had lifted around the ball, while the backline had tightened up. It was a good game of footy, belying the tricky conditions. Trevo took some telling marks around the ground and was teaming well with Thommo out of the backline. Caulfield were still in the game, and a couple of strong marks resulted in majors. Most of the play was on the Bambra Rd wing which disappointed fans from both sides who were sheltering from the artic conditions on the other side. (All except Mr. R Paul who is missing Doyley but pays tribute). The throng headed for the now infamous tea, scones and party pies with the boys leading by the narrowest of margins. Improved accuracy was becoming a feature, much to Felicity’s delight. The third quarter didn’t immediately go to script. The visitors jumped the gun and literally strolled to a 16 point lead. It felt like we had barely touched the ball and it was looking a little ominous. But once again the boys found another gear. Nick Gooda scored on the back of some terrific ball movement from Brodie Steele, Nicho and Jimmy Paul and Jordan Donnelly weaved some magic from a sharp angle to show that the goal of the year against Blacks was no fluke. We were right back in the game and when skipper Paul goaled, we were back in front. Funnily enough, the wind sockets suggested the cricket net end would be the scoring end but goals were being registered in both directions. We had narrowly won the quarter and went into the last, with a slender 4 point lead. The last quarter shaped up as one of the most vital played by the club for a number of years. It was tense in the huddle but a sense of determination was also present. Wardy got them in real tight so it was for players’ ears only – would it work? Of course it did! Loewey snagged a beauty on the run from 50 metres out and the boys were up and about. Caulfield answered but Sec duly and calmly replied. Shak bullocked his way through a pack to score and give us a handy break. The footy flowed between the half back lines and our defence was holding up well, as Caulfield tried to rally. The young guns – Jack Munro, Callum Searle, Tom Rogerson and Brodie Steele were still prepared to take the game on and force opposition mistakes. Unlike previous weeks, we capitalised. Nick Gooda and Pop converted some pressure goals and with “only” 7/8 Bonwick minutes to play there was some relief around the ground. Caulfield got one late but it was too late as the words “bellow them over” resonated for the second time at PP. The Ressies were gallant in defeat – once again. The boys keep coming up against physically stronger opposition but remain in the contest for long passages. Invariably, the physical side takes its toll although on Saturday we managed to score a couple of majors to take the game right up to Caulfield. Josh Elston and Jamie Cain were both terrific all day while Joel Constable had a solid return from injury. The Gauch was at his elusive best on the forward line. The Hearts posted an encouraging victory over a determined Ajax. Coming off the back of three losses in a row, The Hearts came out firing against the strong team of AJAX. After two weeks of reshaping their game plan thanks to their loss against Beaumauris Sharks, the girls were finally able to move the ball with more speed, thought and skill. The marking capabilities of rotating mid/forward Jordan Shanks proved to be a game winner, with Shanks kicking three goals in the second term, surging the girls ahead. The girls maintained speed and accuracy in moving the ball in the third term, with Tayla Vines Chapple & Pulli Gardiyawasam leading the way. Two freakish goals from Amy Fletcher & Jess Wright put the girls well in front. The final term saw Ajax pick up speed and get it back into their forward 50, but thanks to the skill of defender, Charlotte Russo, their efforts came with no reward. This game was one of the best that coach Spud has seen from the girls, who served up 4 quarters of classy footy. We look froward to taking on Hampton Rovers next week, where we will continue to refine & practice our game plan that is evidently working. Next week we are on the road again. The boys take on ladder leaders St Bernards but can go in with confidence. This is the return game of the Peter Nicholson Cup so there is a lunch on if anyone is interested in joining hyxy. The girls play Rovers at PP with the game starting at 1pm – not so far to travel. The next home game luncheon will take place on the 14th of July. We will post further details as they come to hand. But be prepared for an interesting guest speaker and the usual excellent spread. The “Goods and Services Auction Night” has attracted some brilliant auction items. This includes a $100,000 outdoor marketing package, kindly donated by QMS. This is a sensational package and would suit businesses looking for extra publicity. This is a major fundraiser for the club so make sure you plan to get along. There will be a live band, finger food and with drinks at bar prices, this will be a great night out for only $50. The venue is the Brighton Baths Function Room with festivities starting at 6.45pm. Numbers are limited so get in early!